My wife was pretty stressed up recently. So tired and stressed up was she that we decided to make a drive up to the east coast of Johor that very weekend. To Tanjung Balau and Desaru, to be precise, where the white sandy beaches and swaying pine trees awaits you. Or so I have been told. We drove up on a Saturday, from our home in Johor Bahru (JB), leaving it to the mercy of our four sons, much to their delight. Leaving the house with a little prayer that it remains intact when we get back, we took off and decided that since it was going to be an easy drive, we were going to take the Kota Tinggi route instead of the new Senai Desaru Highway. We stopped over for brunch at Kota Tinggi, noting that it didn’t take us that long to get to Kota Tinggi as we thought. 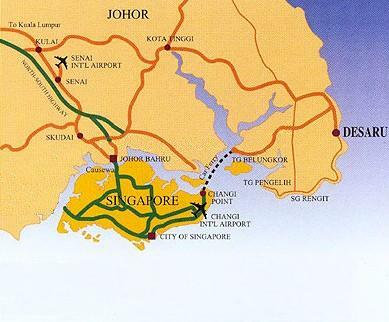 Maybe the new highway from Senai to Desaru got something to do with it, taking on traffic that would otherwise be on the roads heading in and out of Kota Tinggi. Brunch was briyani and nasi lemak. For a layman like me, a briyani is a briyani is a briyani. The only difference between the briyanis of the world, for me, is whether its chicken briyani, mutton briyani or beef briyani and whether it taste good, or not at all or something in-between. Either way, whats left of the briyani on my plate will be dependent on whether I was hungry or otherwise. But for food connoisseurs, like my wife for instance, a briyani is not just a briyani. The rice, the texture, the method of cooking, whether it is Indian briyani or Malay briyani or Arabic briyani etc etc etc. Many a time, she would take just a taste and she could tell the herbs and spices used, how it was cooked, what went in the pot first etc etc etc. The same goes for the nasi lemak. The way the rice was cooked, how much coconut milk was used (and whether they actually used coconut milk), the taste of the sambal (cili sauce) and its ingredients etc etc etc. Well, since the verdict was a thumbs up for both the dishes, so I guess the restaurant has a pretty good cook in their kitchen. After brunch, we continued with our journey, with Tanjung Balau planned as the first port of call, and Desaru thereafter. We reached Tanjung Balau in pretty good time, and I did not know that I too was in need of a break as well until we reached Tanjung Balau and saw the open sea. The sight of the open sea that is the South China, does give you the feeling of expansiveness and you could almost feel the weariness of life’s daily rigours slowly leaving your body. Something about the salt in the air, I think. That and the sway of the palm trees and the sea breeze and the heat. Oh My God, the heat. But then again, it was about noon time when we got there, so it comes with the package. After paying the RM2 entrance fee, the first thing that hits you as you enter the first of the museum’s four halls of exhibits was the air-conditioning. My word, the RM2 was well worth it, even it was just for the air-con. A respite from the prickly heat outside, indeed. The museum is a small museum and focussed mainly on the lives of the local community who, in the days of old, were mainly made up of fisherfolk. Plenty of old photos adorning the walls re-inforced that fact. The main attraction at the museum had to be the artifacts found on a wreckage nicknamed ‘The Desaru Ship’, for want of a better name, discovered in nearby waters. Name unknown and Chinese in origin, it sank in the 1840s with Chinese ceramics and jars amongst its cargo. 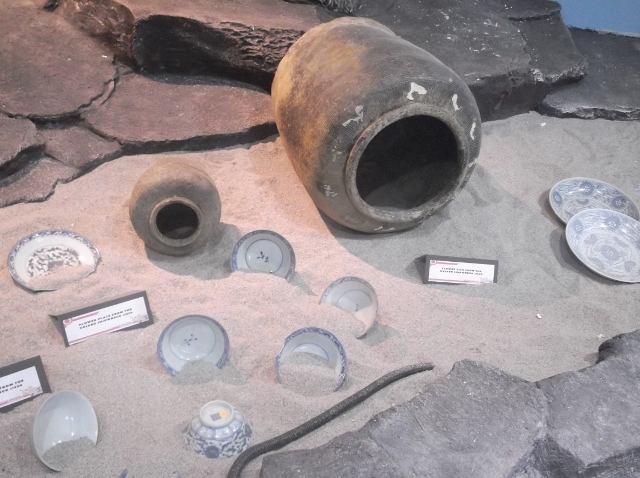 It suddenly dawned on me that Chinese ceramics and jars must have been big business back then, judging from the many discoveries of the same from most of the sunken ships salvaged in the region. However today, the once-upon-a-time mainstay of the local economy ie the fishing industry, has given way to tourism as its main revenue generating activity, what with chalets and homestay accommodations readily available and widely advertised judging from all the signboards that we see in Tanjung Balau. However, if that is to be the case, then there is an urgent and vital need to take the situation up a notch in Tanjung Balau. 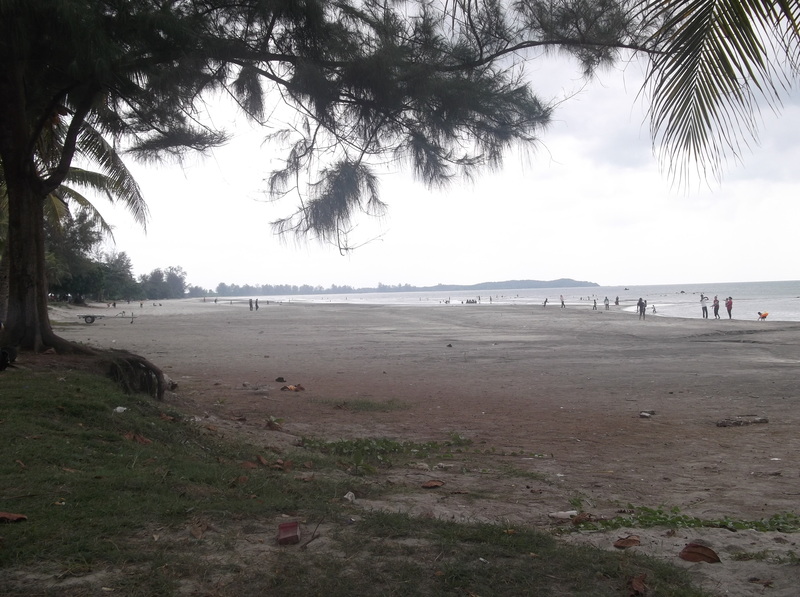 From what little I have seen, Tanjung Balau needs serious sprucing up to attract more local tourists. It needs more public facilities and amenities, and what is currently available needs upgrading and serious upkeeping. That is, if the authorities that be (KEJORA? The Federal Ministry of Tourism? The Johor State Government?) 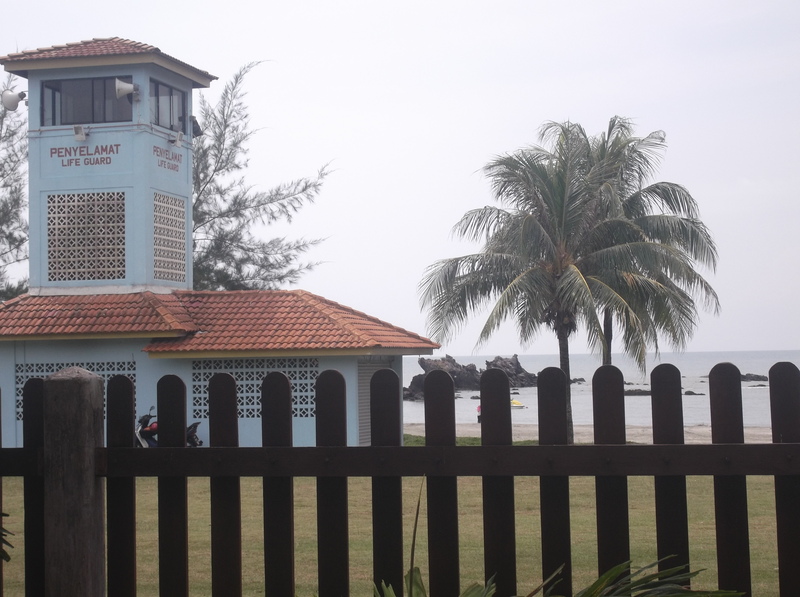 are serious about developing Tanjung Balau and its surrounding areas as a worthwhile and affordable tourist destination, to complement the nearby resorts at Desaru. But affordable doesn’t necessarily mean that it cannot be well maintained and clean, does it? From Tanjung Balau, we then made our way to Desaru. Being fairly new to this part of the state, we took the ‘long’ way to Desaru, taking us first to Bandar Penawar and then to Desaru. If we had been a regular visitor to this part of the state, we would have taken the short cut to Desaru by turning left at the first roundabaout as you leave Tanjung Balau. But as fate would have it, we found ourselves heading towards Bandar Penawar, with its famed school of excellence for sports. Formerly known as the Bandar Penawar Sports School (BPSS), it has been re-named the Tunku Mahkota Ismail Sports School (TMISS), after the current Crown Prince of Johor, Tunku Ismail ibni Sultan Ibrahim ibni Almarhum Sultan Iskandar. TMISS has done the state proud and has developed quite a good CV with regards to the development of athletes, challenging the more established Bukit Jalil Sports School (BJSS). And so, in we went into the lobby and after admiring the view of the hotel from the inside, we made our way to the beach. Passing by the swimming pools, and the gym and the garden, we finally reached the beach and it was all it was made up to be, with one or two exceptions. 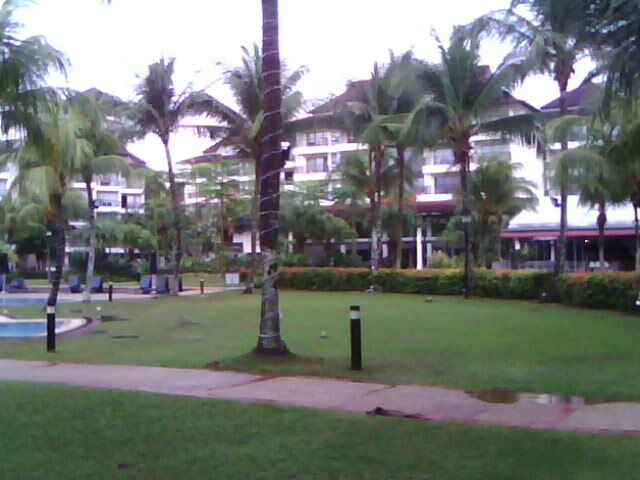 Desaru is a fine tourist destination with a long stretch of white fine sandy beach to stroll to your hearts’ content. It still has lots of potential to be developed into a premier holiday destination. Just ask the hordes of Singaporeans and Malaysians who make their way there to spend a weekend away from city life, as it were. It’s a joy to be able to stroll along a long stretch of white fine sandy beach, with the waves of the South China Sea crashing onto the beach and pulling at your feet as it flows back to the sea. But in so saying, something has really got to be done about the rubbish on the beach BEFORE it really spoil things up for tourists, both domestic and foreign (and that goes for Tanjung Balau as well), IF that has not happened yet. I am not so sure as whose responsibility it is to ensure the beaches are kept free from rubbish. Admittedly, you can’t do much about rubbish washed ashore from passing ships on the horizon but surely, the hotels lining the beach must bear some, if not all, of the responsibility in ensuring the beaches stay clean. After all, the beaches do form part of the attraction of these hotels and surely they have benefitted from that very fact. Despite the many people swimming and fooling around among the waves, for the life of us, we could not see any lifeguards. 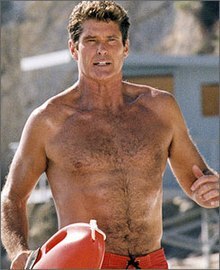 Well, we don’t expect them to sport red shorts or a red bikini, or a David Hasselhoff (for the ladies) or a Carmen Elektra (for the guys), but I do think lifeguards are essential in this case. Afterall, those in the water are the hotels’ guests and their well-being is of importance. Surely that must count for something. We promised ourselves coffee at the hotel’s coffee-house but since we were also hungry instead of just thirsty, it turned out to be early dinner instead. As the buffet spread was not ready yet, Ala carte it was then. After finishing the food that we had ordered, and enjoying the last rays of the evening sun, we made our back to good ole JB. This time, via the Senai Desaru Highway. God bless the Senai Desaru Highway. It makes driving home so much easier and makes the eastern parts of Johor so much accessible. It was a well worth trip. Enjoyable, fun, and one to be repeated. And guess what? The house was still standing when we got back.